Fig. 1. Ablation range and tunnel creation within the anterior cruciate ligament (ACL) tibial footprint in the two groups. 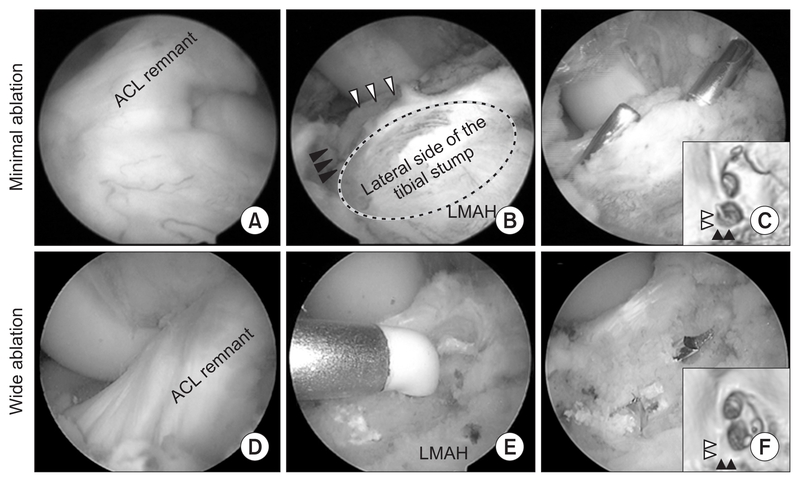 Tibial tunnel aperture of the left knee for the minimal ablation group (A–C), with ablation performed just medial to the footprint (B). (D–F) Wide ablation of the tibial stump, with no ACL stump retained. Black arrowheads: Parsons’ knob, white arrowheads: medial intercondylar ridge, black circle: lateral side of the tibial stump, LMAH: lateral meniscus anterior horn.